Akshay Kumar’s PadMan trailer is here! Known for taking films with strong social messages (Gabbar is Back, Toilet – Ek Prem Katha) Akshay Kumar is ready with his next release PadMan which is based on a real life, true story, showcasing one man’s decision to help women find sanitary solutions in India. PadMan is written and directed by ad-man turned film-man R Balki (Paa). It is produced by Aruna Bhatia, Mrs Funnybones Movies, SPE FIlms India, Kriarj Entertainment, Cape of Good Films and Hope Productions. It is billed as the most progressive family entertainer yet, starring international megastar Akshay Kumar who assumes the titular role of Arunachalam Muruganantham to once again showcase his commitment to social entertainers. The film’s highly anticipated trailer released today and has received a huge response, in fact over 3 million views for the trailer in a matter of just a few hours. This one is for the mad ones, the ones who are crazy enough to change the world. 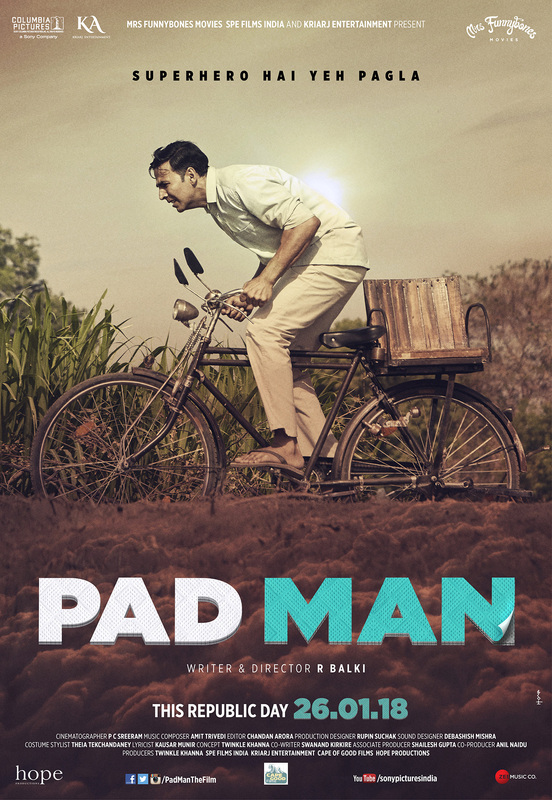 The trailer also features Radhika Apte (Kabali) who performs the role of Akshay Kumar’s wife and Sonam Kapoor (Neerja) who is seen encouraging “Pad Man” to be the superhero we have been waiting for! A new poster of Padman also released today! PadMan releases in cinemas worldwide on the 26th January to inspire us all through Sony Pictures Entertainment, India.